Nessie is overwhelmed with the amount of work that needs to be done to manage the Mecha Mania business she now owns with her father. Balancing accounts, stopping Operators from fighting, and ordering parts keeps her busy—so busy, in fact, that she keeps pushing Joy away. As frustrations build, the distance widens, and what could be slowly starts to move closer to what might have been. This book was well written by an obviously talented author The tension centred around the enigma of Nessie and her emotional relationship with Joy. However I felt the relationship between the two women overpowered the essence of steampunk. I would have loved to hear more detail about the mechanical workings and their ultimate fight. The skeleton of a brilliant confrontation was there unfortunately, for me, it was much too succinct and lacking in tension. I would also have liked to learn more particulars about the garments worn not only by the more well off but also the workers, once again I found this rather overlooked. It was an interesting novel but I felt there was so much more content and potential bubbling underneath the surface. I was disappointed with this story. 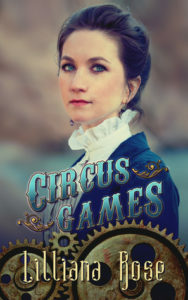 I really liked the first book in this series, and I’m a fan of the steampunk worlds Ms. Rose creates, but this book did not do it for me. There is a vast amount of romance in the first 60% and it’s just the same thing over and over. “She loves me.” “She hates me.” “Maybe she likes me.” Honestly, the only reason I continued reading is because I’ve read the author before and enjoyed her work. Now, the second half of this piece redeems the first half. There’s plot. Good plot that carries from the end of the first book into the new world that Nessie is facing. There’s conflict, issue, and definite character growth. I did feel as though these two characters didn’t quite match up to their personalities in the first book, which I expected with Nessie and her gain of now being the boss, but I did not expect the change with Joy. I’m also glad the issue with rigging the fights was resolved in the very last few pages because I kept sitting there thinking the exact same thing Joy was thinking the entire time. Lastly, I struggled with the writing in this one, not sure why. But there was an abundance of passive phrasing that kept throwing me off and out of the moment of the piece itself. NOTE: This piece can stand-alone from the previous one. Lilliana is a creative writer and poet. She enjoys pulling levers and turning cogs in steampunks worlds. Recently she put on her old dusty farm boots for inspiration to write a rural romance (Chasing Dust Clouds) – variety is the spice of life!